The following image files are supplements for Estimating Internet address space usage through passive measurements. The one dimensional IPv4 address space is rendered in two dimensions using a space-filling continuous fractal Hilbert curve of order 12. In all maps, grey areas represent unrouted networks, whereas black indicates a routed network not determined to be active. To establish a set of unrouted IPv4 address blocks, we take a list of BGP prefixes announced and captured by the route-views2.routeviews.org collector between July 31 and September 2, 2012, and assume all other address blocks are unrouted. Hilbert map visualizations which compare multiple datasets. Hilbert map visualization comparing the merged passive (UCSD, Merit and SWITCH) datasets with the ISI Internet Census data. Each pixel represents a /24 network; red indicates those subnets observed only in the passive data, green those only observed in ISI Census data, and blue shows networks common to both. Unrouted networks are shaded gray. Hilbert map visualization comparing the /24 networks observed in the merged darknet (UCSD and Merit) datasets with those in the SWITCH data. 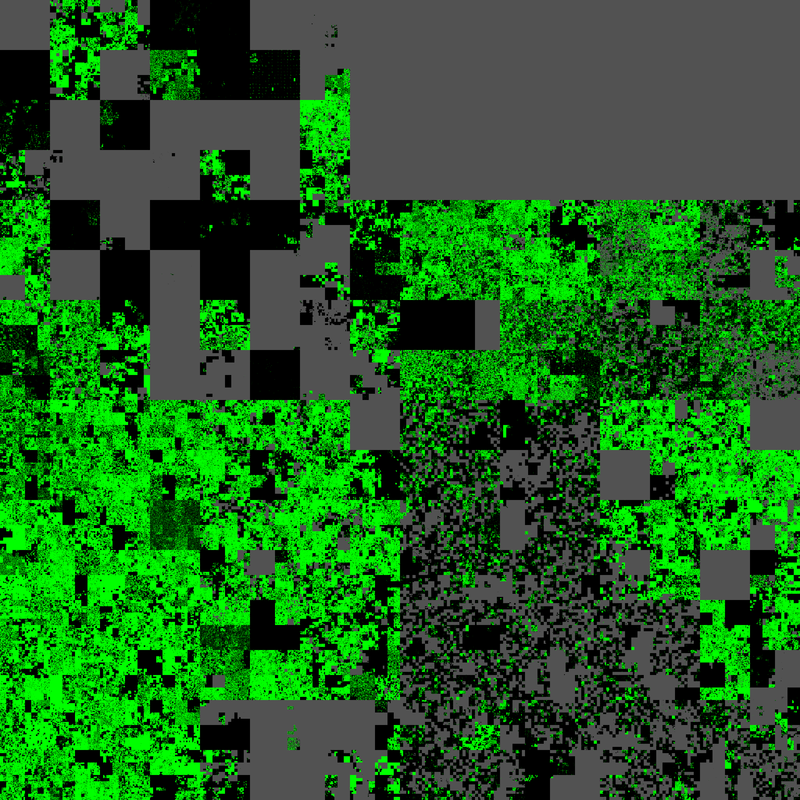 Each pixel represents a /24 network; red is used for subnets observed only in the darknet data, green for those only observed in SWITCH data, and blue shows networks common to both. Unrouted networks are shaded gray. Hilbert map visualization comparing the /24 networks observed in the UCSD dataset with those in the Merit data. Each pixel represents a /24 network; red is used for subnets observed only in UCSD data, green for those only observed in Merit data, and blue shows networks common to both. Unrouted networks are shaded gray. 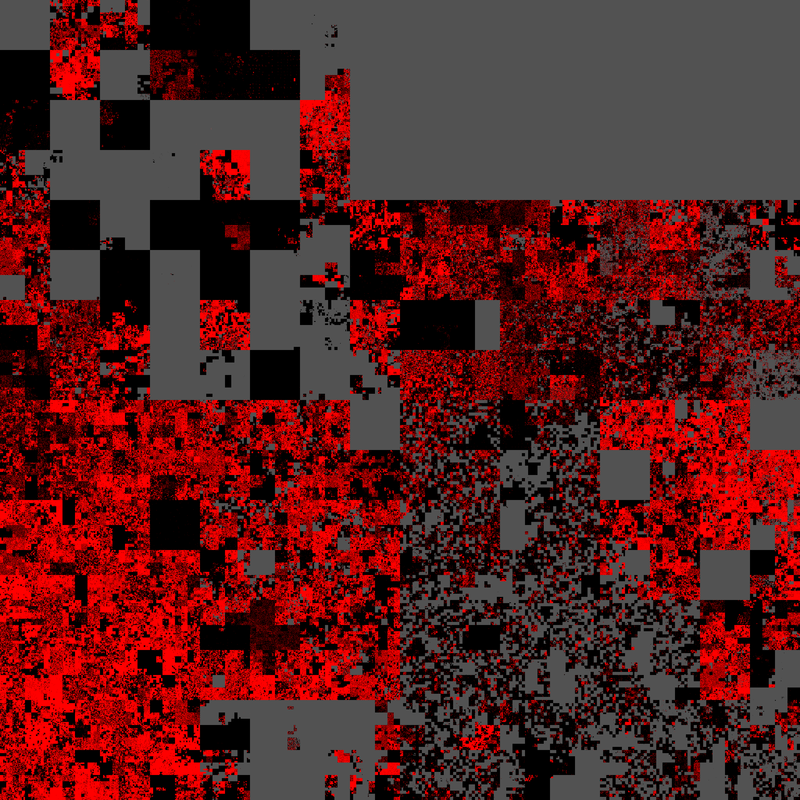 Hilbert map visualizations of each dataset used. All datasets reflect a collection period between July 31 and September 2, 2012. Hilbert map visualization of the /24 networks that comprise the ISI Census dataset. Each pixel represents a /24 network for which at least one IP address was observed. These /24 networks were extracted from the ISI Internet Census dataset (it49c-20120731), which was obtained by probing the entire IPv4 address space. Based on the suggestions given in the Internet Address Survey Binary Format Description, we filtered this dataset to only those probes for which an ICMP echo reply response was received, and where the source address in the reply matched the target address of the original probe. In addition, we filtered out all the probes sent to IP addresses with the least significant byte equal to 0 or 255, since such addresses are often reserved for network and broadcast addresses respectively and they may be intercepted along the path (and replied to) by a third party. Unrouted networks are shaded gray. Hilbert map visualization of the /24 networks comprising the UCSD Network Telescope dataset. 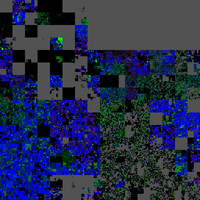 Each colored pixel represents a /24 network for which at least one IP address was observed. Unrouted networks are shaded gray. Hilbert map visualization of the /24 networks comprising the Merit Network Telescope dataset. Each colored pixel represents a /24 network for which at least one IP address was observed. Unrouted networks are shaded gray. Hilbert map visualization of the /24 networks comprising the SWITCH dataset. Each colored pixel represents a /24 network for which at least one IP address was observed. Unrouted networks are shaded gray.